Maybe you’re aware of Netflix. Maybe you even have a subscription for their services. You might have also heard of or watched a series called Stranger Things, produced by Netflix. But did you know that Netflix has been selling a Collector’s Edition box set of Stranger Things that incorporates pictures from my webpage, The VHS Corner? I didn’t, until some kind netizens contacted me to tell me all about it. I was contacted at 7:56 am on November 5th, 2017, by the operator of discjunkietv on YouTube. 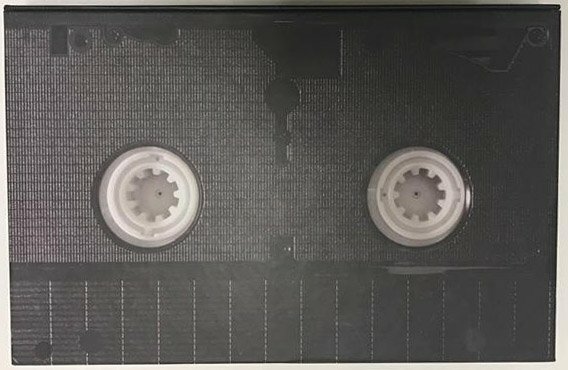 He reported posting a video online about the Stranger Things Season 1 Target-exclusive Special Edition Blu-Ray Box Set and that a commenter (DVD and Film Bloke) had recognized that the images on the inner box resembling a VHS cassette are taken from my Intro – Inside the VHS Cassette & VCR page. After a quick confirmation, he decided to contact me about it. Thanks to the help of discjunkietv, I had good quality images of the inner box. Initially, I only knew that the top-side had been taken, but it turns out that the underside was also sourced from my website. The cover design of the Stranger Things collector’s edition boxed set. My photo of a VHS cassette. 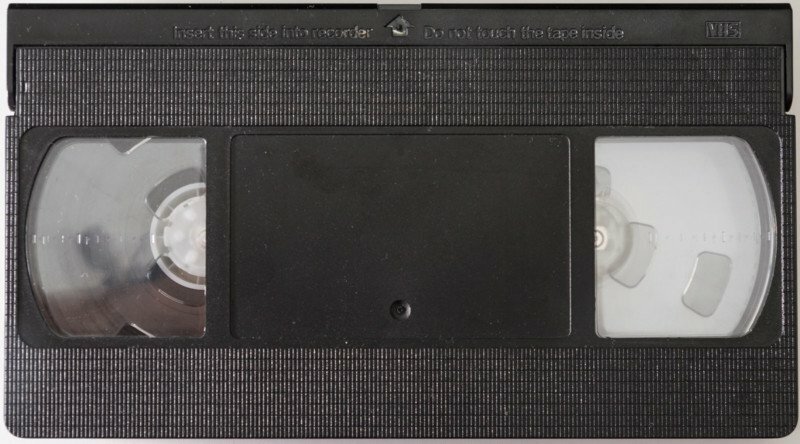 Note the identical dirt in the flip-open tape cover, identical molding defect in the top-left area, identical reel positioning, and reflections. The image had been altered to fit the desired aspect ratio through cloning several rows of the pattern in both top and bottom areas, with the bottom corner filled in. They have also added their own “faux” labels on top of the center portion and right reel window. The back design of the boxed set. Note the virtually identical image down to the offset of the reel-hubs in their respective apertures. Again, some modifications were made to fit the desired aspect ratio, but the images are essentially identical. Unfortunately, I could not identify the source of the spine and side images based on the given pictures, however, it seems at least that the side may not have come from my website directly. It does bear resemblance to the Fuji AG grade cassette side which I had imaged at an oblique angle. These may not be my images. As proof that I am the originator of the said images, here are two screenshots showing the metadata from the raw NEF from the camera. As a double-check, a friend sent a link to photos posted by Jeremy Konrad as independent verification of the images above. At a later date, I was also informed that the upcoming 4k UHD release with different outer-cover art will also have an inner box using the same base images, as shown in this Imgur gallery by rpvee. Initially, I was in disbelief for two reasons. I’ve not watched Stranger Things, but I’ve heard a lot of good things about it. Could it be true that my work has become a part of their product and I should be so honored to be part of it? The images I were seeing did not lie. They were my photos. Then it turned into a feeling of betrayal. How could they, a large corporate company with day-to-day experience in handling rights-protected materials, use my material without so much as asking me for permission? How did they think they can get away with it? I’ll admit, I’m not a lawyer, but I do have a moral right to copyright over the images I take that does not require any registration. At the least, they have chosen my images because they are somehow special (e.g. well taken, high resolution), and I deserve to be compensated for it. At 9:08 am on the same day I learned all of this, I set about trying to contact Netflix about it. Contacting Netflix is hardly an easy task as no e-mail addresses are available, so I had to resort to live-chat to try and get to someone who can help. This was a long process, as it took about 10-15 minutes for the customer service representative to find the necessary contact details. Shelton Netflix: Thank you Dr. Lui for letting us know about this concern , your opinion is very important for us,please, bear with me one minute so I can get you the right information about who to contact so we can get this solved for you. Shelton Netflix: Thank you so much for you time and patience, I’m still retrieving the right information for you so you can get your concern clarify. one more minute please. You: No problems. Understood :). Shelton Netflix: Thank you once again for your time, I did research about your concern and since we are not able to handle this issue over the chat I found the right department that can surely better assist you so you can get all the responses about this inconvenience, please address your concern to **************. You: Thanks for the information. In the future, it would be easier if an e-mail address of some sort could be more prominently available under your contact details so I don’t have to “bother someone” to find it for me. Shelton Netflix: And one more thing, if you wouldn’t mind, please stay online for a one question survey. 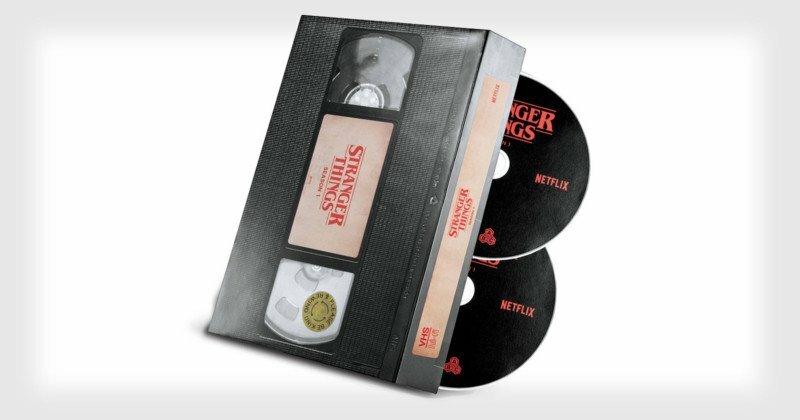 I have been made aware that your recently-released Target-exclusive Stranger Things Season 1 Blu-Ray Collector’s Edition Box features a prominent image of a VHS cassette. It has come to my attention through a number of fans of Stranger Things that the prominent image featured is my image that I had photographed and published on my personal website, specifically on [URL]. 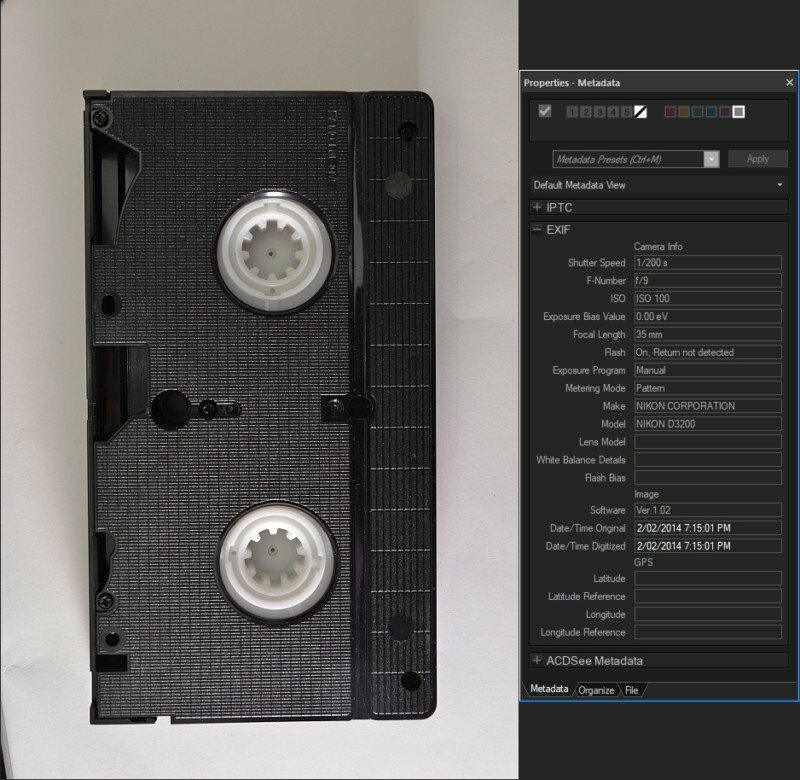 As a VHS aficionado, I have posted some of the better quality images available online which are frequent targets of image theft. I was not contacted about its use, nor was any licensing of the image sought. Given the prominent copyright notice printed in the footer on each page, I assert my moral right to copyright over this image. When compared with my image, note the reflection in both VHS reel windows, dirt in the VHS cover lid and “chip” in the patterning on the left side, all of which coincide at a level beyond just mere coincidence to indicate this image is indeed the one I had taken. Who made the decision to use my image without permission, attribution nor contact? Who approved the artwork without reviewing any rights materials? How you propose to remedy this situation, as I am sure the discs themselves would see sizeable circulation for which I have not received any compensation for my efforts. I look forward to your co-operative response. Thank you for your message. If this is press-related, we do our best to respond to most media requests within a few hours. Please note: we do not monitor this inbox during weekends. If your matter is regarding customer service, please refer to help.netflix.com for alternative contact information. We do not respond to customer service related issues through this email address. If this is regarding a sponsorship request, someone will contact you if it’s of interest. If you are submitting a film for consideration: unfortunately, we do not accept or review unsolicited materials or ideas. For that reason, we will not consider any materials or ideas we receive that were not specifically requested by Netflix or submitted via an aggregator or established agent through the appropriate channels. I was given this contact by your customer service team as the best contact to use, but I have not heard back from you in regards to my inquiry. Could you please acknowledge whether this inquiry is being handled, and as to the progress or whether there is a more appropriate contact. It has since come to my attention that the images used on the other sides of the collector’s edition box are also my images which were taken without obtaining permission. I would hope not to have to post an article on my website and go through social media channels to reach a resolution to this matter. The message was successfully received on my alternate e-mail address, so the send did complete and no postmaster warnings were returned. However, it’s been over two weeks since my initial e-mail, and yet no reply has been entertained. It seems I am being ignored. As a result, I’ve had to do what I hate most — turn it into a social media “thing”. I am hoping that by making this public posting, at least this injustice is documented, with the hope that it catches the eye of someone responsible enough to look into the matter and offer appropriate compensation. When and if that happens, the record will be updated accordingly. Image licenses can frequently run up to $600 per image depending on use. In the case where people are not contacted beforehand, an additional penalty is considered customary. But of course, I have no ill intentions. I have no intention to ask them to stop selling the items. In fact, I’m happy people are nostalgic about VHS. I’m not looking to milk the situation at all. I’m not threatening to get a lawyer on their case. I’m just frustrated that I had to find out from someone else in the first place. I’m frustrated that despite my photos being used, I’m not getting any compensation whatsoever. I’m frustrated that I have to spend time chasing when I could be spending time doing something else. I’m extremely frustrated that the piece of art they have produced resides on a box set which I cannot even hold in my own hands, as it’s US-only. I’m half-way around the world in Australia, so did they think they could get away with it? Topping it all off, once I tried to contact them via the means they have advised me to use, I was ignored. I’ve been unemployed for a while, on holidays for a while, making do as best as I can. I’m a one-man-band operating a personal blog that doesn’t even make AU$1/day after all the hosting and domain fees are considered. An apology and an explanation of how this happened, and what you’re doing about it. Maybe there is something I don’t know? If there is, then let me know. A reasonable license fee as a way to contribute to my work. This would go towards offsetting the cost of equipment and vast amount of time I’ve spent on my blog. I leave the monetary amount open to negotiation, but I’m trusting that you will at least be reasonable. You’re using my images on work that is being sold for profit. A physical copy of the items in question. It’s not particularly nice to have your work used on something that you can’t even hold in your own hands. After all, for a company that had a Quarter 1 profit in 2017 of $178 million, what I’m asking for is not even a rounding error. So, how about it, Netflix? You know how to reach me. You’ve already got my e-mails. About the author: Dr. Gough Lui is a technology enthusiast living near Sydney, Australia. You can find more of his work and writing on his website. This article was also published here. Could Red Dead Redemption and GTA 5 be headed to the Nintendo Switch?